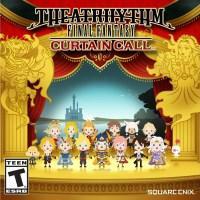 A rhythm game tribute to the long-running Final Fantasy series. There are songs and characters from essentially every game in the franchise (and some from other Square Enix titles through DLC). Songs are grouped into a few different kinds of levels depending on the nature of the music - battle music has you fighting a series of monsters, event music plays over cutscenes, and field music has you journeying through the game world. It’s all layered on top of an RPG system where you build a party of four, level them up, and equip items and abilities. It’s essentially an expanded and polished upgrade of its predecessor that renders the original obsolete. Every song and character that was available before on either platform, including DLC, is now included in the base game alongside new additions as well - and of course, yet more DLC is available. The rhythm gameplay is still quite solid, and it benefits from the addition of button-based and hybrid control schemes as an alternative to using the stylus for everything. And the RPG systems are better integrated - there’s no longer a massive score bonus for eschewing abilities and items, and the new “Quest Medley” mode lets you play through a mini campaign across multiple songs which actually requires a bit of strategy and resource management. Ultimately, though, the context is still lacking. Final Fantasy games often have excellent scores, but if you love these songs it’s because of what you were doing when you heard them. You were exploring wondrous worlds, fighting epic battles, and becoming a hero. While the music added to the emotional weight, it could only do so because the events it accompanied were already strongly contextualized. In Theatrhythm , it’s the same songs but you’re walking a disconnected patch of land with no actual destination or fighting random enemies without even a real victory screen because combat is still backward. There’s no real worldbuilding and only a paper-thin story with the overall plot goal of just playing a bunch of songs. Although a wide variety of characters are featured, they only have the merest hints of personality and are mostly wrappers for varying stats and abilities. Even the event songs, which previously provided the most story context through their accompanying cutscenes, have been drastically reduced this time around. Overall, it’s a competent if basic rhythm game wrapped in Final Fantasy theming and RPG mechanics that aren’t anchored in story, world, or character. While this version is clearly the definitive Theatrhythm Final Fantasy experience, it’s still primarily a Final Fantasy music nostalgiafest. If you want to reexperience highlights from the franchise’s soundtracks in a more interactive way than just, you know, listening to them, this’ll do, but it doesn’t rise much above that. I Stopped Playing When: I played for an hour or so, including several songs in free play and a short Quest Medley. While I enjoyed the play time, I realized afterward that I had no desire to return - unlocking characters and leveling them up and futzing with party composition wasn’t appealing without emotional context and I’d already played most of the songs I cared about in the first game and now I own the relevant soundtracks anyway.